The Blue Ridge Mountains are a part of what makes Western North Carolina so popular with tourists. Visitors from all over the world travel to the area in which our Linville Falls Lodging is located to admire the scenic vistas afforded by the majestic mountain range. Many rivers and stream originate high atop the slopes of the Blue Ridge Mountains, in which our Western NC Mountain Cabins Rentals are nestled. Rushing downstream through the mountainous terrain, some of these rivers become raging rapids. Full of large boulders, bordered by pristine forests, and home to abundant wildlife, these rivers are ideal for whitewater rafting. A thrilling sport that has been enjoyed by families and groups for years, whitewater rafting is an exciting way to make memories that will last a lifetime. You and your travel companions will have the time of your lives when you embark upon a whitewater rafting adventure on one of the many rivers that are close to our Blue Ridge Parkway Cabins. Several guide companies specialize in taking visitors on tours of the many rivers that surround our Western NC Cabins. High Mountain Expeditions, Edge of the World Whitewater Rafting, and Wahoo’s Adventures are just a few of the great guide companies that are within a short distance from our Western NC Cabins. High Mountain Expeditions is a fantastic guide company for families with small children who are visiting our Rental Cabins Western NC and embarking upon their first Whitewater Rafting in NC expeditions. Tour groups will meet at the Watauga River, a little over an hour from our Western NC Cabins, where they will “put in” in the calm waters at the base of Wilburn Dam. The swiftly moving water and mild rapids make for a delightful trip downriver, and Canadian geese, ducks, and woodland scenery provide a varied array of sight-seeing opportunities. Water fights, lunch, and even a chance to take a dip in the Watauga River complete your Whitewater Rafting North Carolina trip, and you’ll find yourself discussing all the fun you had on you way back to our Blue Ridge Parkway Cabins. 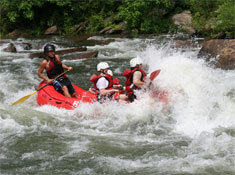 More adventurous visitors to our Western NC Mountain Cabins Rentals will want to give Wilson’s Creek a whirl. One of the steepest Rivers in NC, this Whitewater Rafting in NC river is just minutes from our Vacation Rentals in Western NC, and drops an amazing eighty-five feet per mile, making for one unforgettable trip. Edge of the World is another guide company near our Cabins in Pisgah National Forest that caters to those seeking adventure on Rivers in NC. Open Memorial Day weekend through Labor Day Weekend, Edge of the World has been guiding visitors down the Watauga River for Whitewater Rafting in NC for twenty-three years. With humorous guides who want to help you have the best and safest time possible, and homemade lunches of Southern fried chicken and biscuits, Edge of the World provides guests with a memorable experience. These professional tour guides will take care of every aspect of the trip—from gear to photos—so all you have to do is show up and be prepared to have a great time. Wahoo’s Adventures operates out of the Boone area, just minutes from our Cabins Hot Tub Western North Carolina, and takes visitors on whitewater rafting adventures in Rivers in NC as well as Tennessee. No matter the size, Wahoo’s can accommodate any group. First-timers will enjoy a trip on the gentle Watauga River. The Nolichucky River is great option for beginners and intermediate level rafters, and includes class III and IV rapids. During the entirety of the 11-mile trip, you will be surrounded by land protected by the U.S. National Forest System, which offers wonderful sight-seeing opportunities during your White Water Rafting North Carolina trip near our Linville Falls Lodging. Wahoo’s also provides guided tours to Wilson’s Creek’s class V rapids for more experienced rafters. For over 30 years, Wahoo’s has been guiding guests through some of the area’s best rapids and thrilling their taste buds with their acclaimed Famous Deli Gourmet Buffet Lunch. No vacation to our Cabins on the Blue Ridge Parkway would be complete without a whitewater rafting trip. Western North Carolina is full of fantastic whitewater rafting opportunities, including Wilson’s Creek, the Watauga River, and the Nolichucky River, and the many other rivers that are close to our Western NC Cabins. These many rivers, and streams are not only ideal for White Water Rafting NC, but are also great for Fly Fishing North Carolina. There are an unlimited number of opportunities to enjoy outdoor activities like Hiking North Carolina and visit some of Linville NC’s most beloved landmarks, like Linville Falls NC, Linville Gorge North Carolina, and Linville Caverns NC, in the area in which our Vacation Rentals in Western NC are located. Grandfather Mountain North Carolina is another popular draw, and Biltmore Estate Asheville is just 57 miles from our Linville Falls Lodging. Ideally situated, our Western North Carolina Cabin Rentals are perfect for almost any kind of vacation you can imagine. From birthdays to anniversaries, from a family vacation to a golf getaway, our Rental Cabins Western North Carolina have all the amenities of home and are located close to all of the most fun and excited Western North Carolina Attractions.